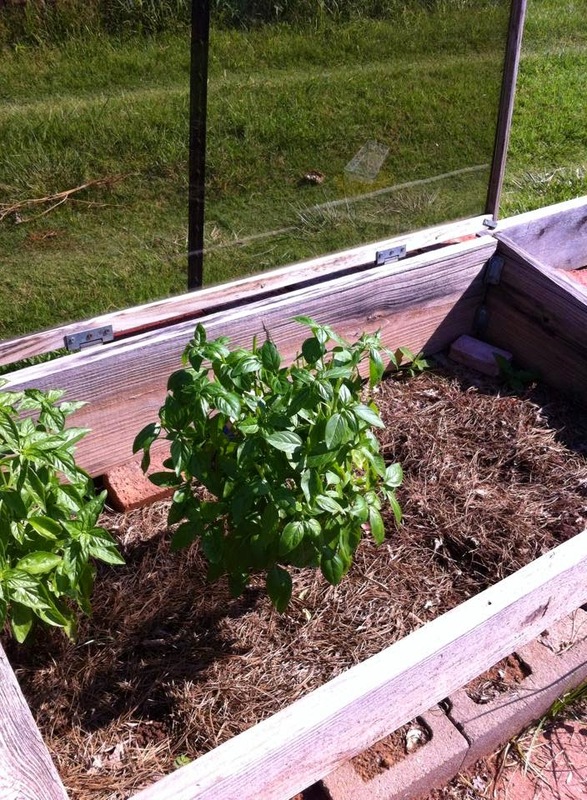 When basil flowers, its energy goes into making seed, instead of leaves. And, because it is the leaves that you want, this is a bad thing. The flowers are not large or showy, but the bees loved them and we love the bees because they help pollinate our crops. Don't worry. It will regrow quickly. The point is that you have to practice "tough love" to keep it producing those wonderful aromatic leaves. So, here is what you should know when trimming your basil plants. 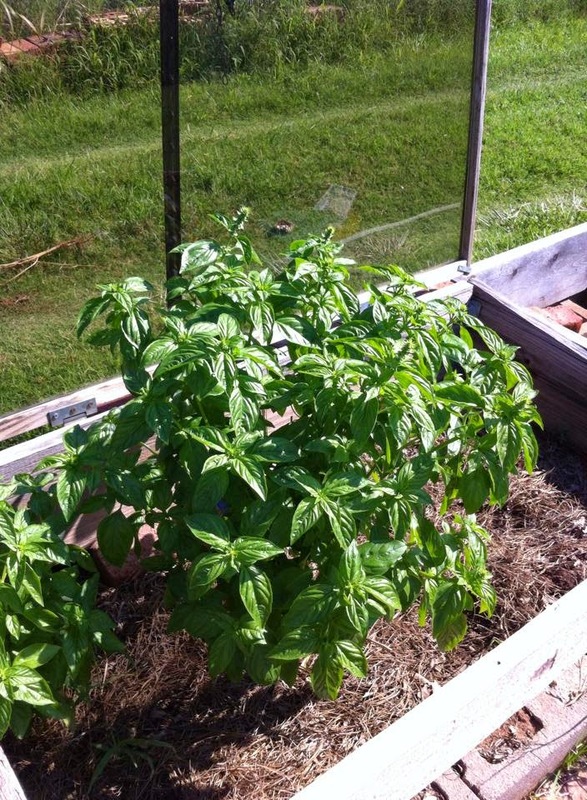 When you look closely at a basil stem, you'll see that it has smaller branches coming off the main stem. It is important to cut the main stem just above where the smaller stems are growing. So, if I were going to cut the stem above, I would make my cut about 2 inches to the right of my thumb. See below. If you follow this method, then the two smaller stems will grow large and produce more leaves. Thus, you get twice the number of leaves as you have on the original stem. Not a bad deal. It is like doubling your money! My previous two posts have been about tomatoes we are growing this year. I hope you can bear with me for one more tomato post! In particular, this post deals with a couple of tomato varieties we are growing that are classified as "black" tomatoes. I've always been vaguely aware that there were other colors of tomatoes besides red ones. Most of the seed catalogs offer yellow ones, stripped ones, even green ones. However, I usually fast-forwarded through these to the red ones and never give these other varieties much thought. But, last winter while pouring over one of the seed catalogs, I noticed a cherry tomato called "Black Cherry". This one gave me reason to pause because it looked just like the Cherokee Purple tomatoes that we grew last year. As I read the description of this odd little cherry tomato, I noticed it was in a section of the catalog titled "Black Tomatoes". And, not only was Cherokee Purple listed there, but there were several varieties of similar coloring with exotic names like Black Krim, Carbon and Japanese Trifele Black. After doing a little online research I found that the black tomatoes appear to have originated in Russia and slowly spread to other parts of the world, having originally existed in only a small region on the Crimean Peninsula. As they spread, they soon began showing up as new varieties in all shapes and sizes. After some lobbying from me for the Black Cherry tomatoes, we order a couple of these black tomatoes, Cherokee Purple and Black Cherry. Although these are referred to as black tomatoes, most of these varieties are more of a maroon or purple-brown color. In fact, the Cherokee Purples retain their green shoulders while turning a deep, dark red on the bottom. Because the green never really disappeared, we had a learning curve to determine when they were actually ripe. Black tomatoes tend to have an earthy sweetness to them and seem less acidic than red tomatoes. But, you probably won't find them in the supermarket because they are more fragile than the supermarket varieties grown for shipping. So, head down to your local farmers' market to get them. Or, try growing them yourself. A packet of seed is cheap compared to the great taste you will enjoy from tomatoes fresh off your own vines. We always try to grow at least one or two heirloom tomato varieties. The definition of what it means to be an "heirloom" plant is open to debate. But, generally the term, as it relates to plants, means the variety was being grown before World War II. Heirloom varieties are also "open-pollinated" which means that, unlike hybrids, the seeds you collect from a plant one year and replant in subsequent years will produce plants with most of the characteristics of the parent plant. Most heirloom plants have been passed down from generation to generation by saving seeds and replanting them the next year, thus insuring their survival. In the past, we have grown Mortgage Lifter, Brandywine, Yellow Pear, Box Car Willie and Rutgers tomatoes. Heirloom tomatoes can be very sensitive to environmental conditions, needing just the right conditions to produce well. Tom is pretty much the judge as to which ones we keep and replant from year to year. He has come to like Rutgers quite a bit because they seem to consistently produce well here in Oklahoma. The others have fallen by the wayside for whatever reason. This year, in addition to Rutgers, we decided to try Virginia Sweet, Arkansas Traveler and Cherokee Purple. This picture shows them in order listed above. We have found the Virginia Sweets to be somewhat temperamental. They were late to produce, but when they finally did, we got some nice, large tomatoes. The one pictured above does not do them justice. In keeping with their name, they were very sweet ..... sweeter than any tomato I have ever eaten. Arkansas Travelers were bred in Arkansas (our neighboring state) to produce in the hot, humid southern summer and are also crack and disease resistant. They have consistently produced medium-sized fruit all summer and have the wonderful flavor one expects from an heirloom tomato. I expect we will add these to our list of "keepers", along with Rutgers. The Cherokee Purple tomatoes have also produced well for us this year. Once you get past their odd greenish/purple coloring, you find them to have wonderful tomato flavor, just like any other heirloom. To my eyes, they don't look "purple", but ripen to where they are deep red on the bottom and a dark green around the stem. Finally, when sliced they look like this. Virginia Sweets (lower left) are yellow with red stripes. Arkansas Traveler (top) look like any other tomato variety. And, Cherokee Purple (lower right), have a deep red meat with seed pockets that are greenish black.